“You’ve got 5 minutes”, he said with a thick New York accent. 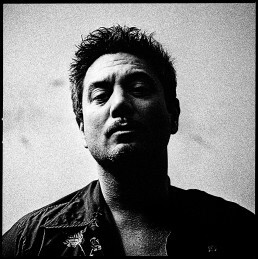 Huey Morgan (singer of Fun Lovin’ Criminals) stood in front of me with a open hand raised towards my face; his fingers spread wide. “No problem,” I answered. Two poses and three expressions later, I was ready. Now he was surprised. We met up after a show of Fun Lovin’ Criminals in Groningen and I gave him an XXL print of the photo. “YOU NAILED IT” he said while he opened the photo box. He appreciated the effort of creating and printing and thanked me profusely for it.